The killing began just before 5 pm on December 6th, 1989 at the École Polytechnique – the engineering faculty of the Université de Montréal. Within less than half an hour 28 people had been shot or stabbed. All the dead were women and they had been singled out. By the following day we knew that the killer had separated the genders and asked the men to leave because he was targeting women. I will not even write his name because I don’t want this person to be humanized. He was “the killer” – he had killed 14 women, wounded numerous others and had 15 more on a hit list. 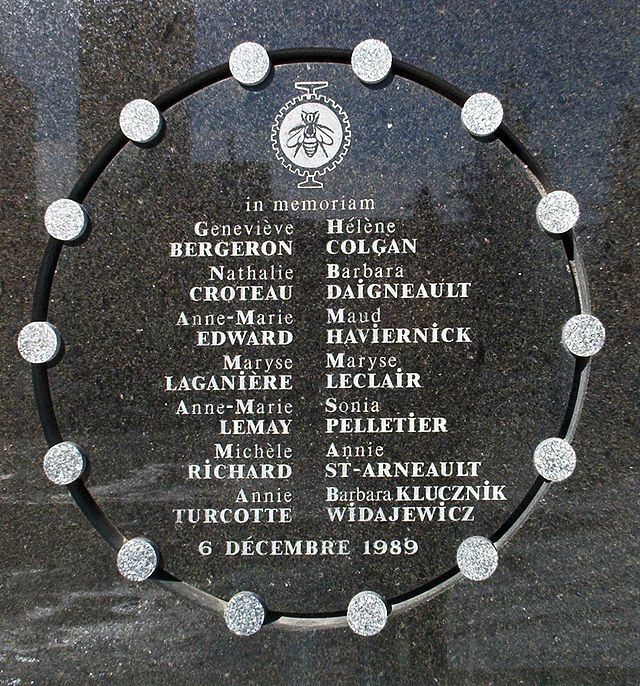 The names I do want to immortalize are those of the 14 women that were brutally murdered that tragic night 25 years ago. They need to be remembered for the dreams they never had a chance to fulfil, for the buildings they will never design, for the families they never raised, and the lives they never lived. They also need to be recognized for the impact they had on how others are now viewing violence against women. Memories of that night haunt the families, the survivors, those that were witness to the massacre and women on college and university campuses across Canada who organize memorial events annually on its anniversary. Nathalie Provost recalls “He told us he was there because we were feminists and I just replied that we were not feminists, that we were just studying in an engineering school and that he would be able to come and study with us and then he shot (opened fire)”. She survived being hit with bullets in the forehead, both legs and a foot. A quarter of a century later women in Canada and around the world are still widely subject to violence. In Canada alone, every six days a woman is killed by an intimate partner. On any given day, more than 3,300 women and 3,000 children are forced into emergency shelters to escape domestic violence. Many more women and girls are sexually assaulted, often by “friends” or family. The Montreal massacre was terrorism, it was violent and spurred the gun control movement in Canada. Unfortunately, the current government abolished the long gun registry in 2012 blaming cost overruns. The Province of Québec is still challenging this decision in court mainly due to the Montreal tragedy. Today, after 25 years, this shooting spree is being recognized as an important day in herstory – this time as a catalyst in the dialogue and the awareness of violence against women. Let us take a moment to remember these 14 brave women. If you want to encourage the next generation of female science and engineering students you can make a donation to Folie Technique, École Polytechnique’s science day camp which helps introduce young girls from disadvantaged communities to the world of science. This entry was posted in Daughter, Inspirational, Mother, Women and tagged #december6, #montrealmassacre, 14 women, 1989, December 6, Ecole Polytechnique, Folie Technique, gun control, herstory, inspiration, Inspired by my mom, inspiring story, Montreal massacre, Mother, Violence against women, white rose week, Woman. Bookmark the permalink.